Many people assume that Hyderabad offers only IT jobs. But the fact is Hyderabad has many kinds of jobs and it is especially known for solid marketing jobs. Hyderabad has many different kinds of industries and companies that are headquartered in Hyderabad. They regularly seek candidates with expertise in marketing. Marketing is a great career for people who want quality work content and something suited to their abilities. Unlike IT, there are a wide variety of jobs that can cater to people having different types of skills/personalities. Many people think marketing is sales. Marketing is not sales. Marketing involves jobs that do not need personal selling skills. Marketing jobs can be broadly categorized into analytical, coordination and creative jobs. Marketing jobs are especially good because in recession, marketing people are more in demand. 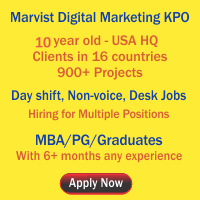 If you are looking for marketing jobs in Hyderabad or Secunderabad or if you need guidance on what all opportunities you have in marketing field, go through this section. Here, we provide insightful articles on choosing a decent marketing job in Hyderabad.